The cards are sold through a National Dealer Network. 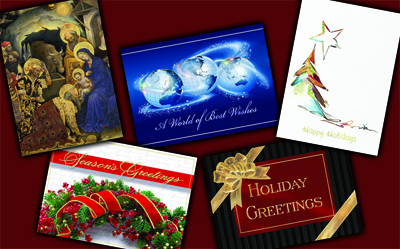 Personalized Holiday Cards keep you in touch with your family, friends, business contacts and contemporaries. An elegant way to send your Greeting of the Season. Save time and effort, and select from a wide range of personalized cards to please every taste. A great solution for a busy time of year. Our dealer network provides you with personalized sales and customer service, and will process your order with accuracy and speed. This year's line brings you Holiday styles including traditional designs as well as contemporary themes. We have most cards available with a Choice of Verse, meaning more flexibility for your Holiday Greeting. Legacy Greetings wants to contribute to your Holiday enjoyment, and be certain you are completely satisfied. All straight copy orders are shipped within 48 hours. Orders requiring special work such as logos or artwork may take an additional two days. Order your printed Holiday Cards through one of our local dealers by September 30th, and receive free return address printing on the envelopes. A big time saver during the busy Holiday Season.